TechPro Security Products expertise for Car Dealership Security Camera Installation comes from our extensive background working with and in the automotive industry. We will design the perfect surveillance solution that will protect your car lot, garages, and inventory around the clock. We have been located in the same area for 10 years and serve all of Florida with car dealership security camera installation services. When you have the right security contractor design and install your surveillance products, you can rest assured that it will be done on time and the proper way. Satisfying our clients with our top-notch security products and installation service is our only mission. 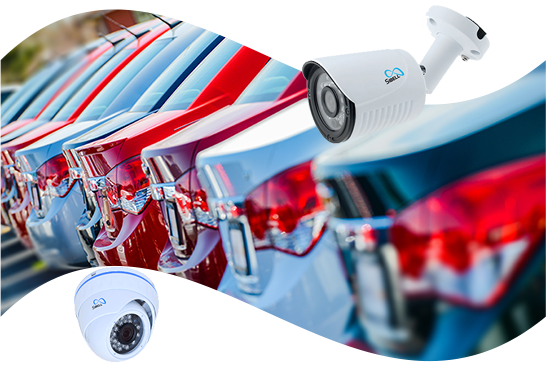 TechPro Security Products has been providing car dealership security cameras and surveillance solutions all over Florida for the last 10 years. Car Dealership Security Camera Installation services for the entire car lot. TechPro Security Products designs comprehensive security systems and installs surveillance products that are built to last. We steadfastly stand behind our security products and installation services. Protecting your inventory and keeping a watchful eye on employees is paramount to any car dealerships overall success. All of our security cameras and surveillance products are fully supported throughout their lifetime. State of the art car dealership security cameras and modern surveillance procedures are blended together with our superior security camera installation service. TechPro Security Products offers complete surveillance coverage at the most economical prices. Car Dealership Security Cameras can easily be monitored remotely, onsite or by anyone who is granted access by you. This allows your car dealership customers, and guests to relax easier knowing they are being protected. We now include many other surveillance related options for our clientele. Remote Video Monitoring and access control can add additional levels of security for your automotive facility. Need to talk to a security camera expert? Find out more about Car Dealershiop Security Cameras today! Car Dealerships are known to keep a high-value inventory that is commonly targeted by the criminal element. The large open air environment allows for easier access for those wanting to commit criminal activities. Watching everything at a car lot around the clock is next to impossible with the high traffic large facilities. TechPro Security Products has the ability to setup your car dealership security cameras so you can monitor every inch of your property. We can employ a variety of car dealership security camera techniques that permits remote viewing, live monitoring with security notifications. Security alerts can be triggered for a myriad of options from the slightest motion to lowest sound levels. Security surveillance is a top priority to consider when protecting your property. TechPro Security Products quick ascension in the security camera installation field is easily attributed to hard work and great security products. Complete client satisfaction is the hallmark of our security camera installation services. We have worked exceptionally hard to become the leading car dealership security cameras installation company.